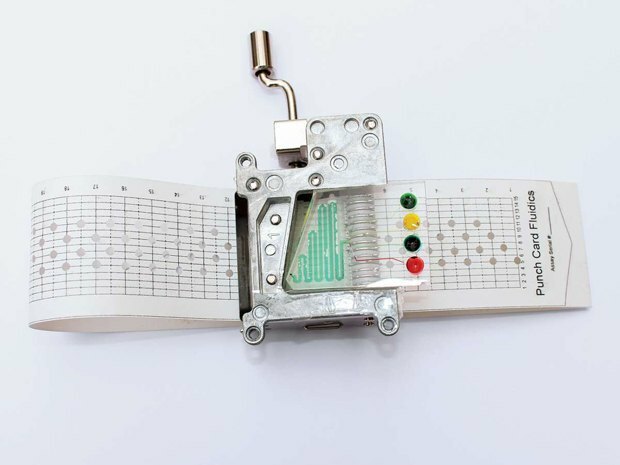 Manu Prakash of Stanford University has developed a programmable chemistry set using the basic analog technology of a music box. Patterned punch cards - which are keyed to connote specific chemical reactions - are cranked through gears with teeth. As the teeth slide into a hole, another tooth squeezes a tube that pumps a chemical through a removable microfluidic chip. The device has 15 different pumps and each pump controls a different chemical, allowing for 15 different chemicals to react with one another. The result of the reaction is visible via embedded lenses that magnify the reaction hundreds of times. How the chemicals reacted to the sample, say blood, will allow doctors and chemists to identify fatal illnesses in rural areas and developing countries that lack conventional lab equipment.